I try my hardest to lock away any personal preferences when I sit down to review music, however when something is so bang on the money it’s hard to ignore the voices in the back of my mind as they scream “THIS IS AWESOME”…. ssshhh I’m trying to write…. 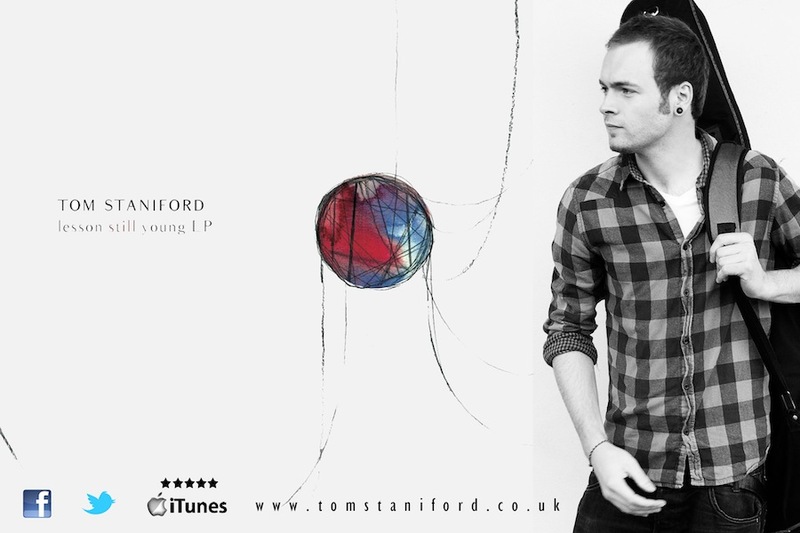 Tom Staniford has a style and voice that is easy to pigeon hole next to a million and 1 other acoustic acts, however, if you listen longer and closer you’ll notice a quirky cleverness in his composition and style. The 2nd song from his “Lesson Still Young” EP is a prime example of this. “Turning Pages” kicks in with typical acoustic guitar chord and a typical low key arrangement of minimal drums and simple bass root notes, by chord 2 however, I found myself saying “Oh… ok… yeah, I see, that’s different, that’s nice!”. It’s a ‘minor’ feeling song, which is refreshing. I was preparing for the usual “happy go lucky acoustic love song” fiasco that’s oh so popular right now. Then comes Tom’s vocals, which borders on Bush’s Gavin Rossdale if he had sucked a throat lozenge or 12. It’s a fantastic cocktail of mood, grit and elegance. The chorus is complemented with a tickle of piano keys and a silky smooth hum from the Cello, which just gives the song a welcomed dynamic boost. Lovely. Lyrically, I had already judged “Turning Pages” by it’s *ahem* cover by thinking “love scorned songwriter starting a new chapter etc etc…” but I was wrong again. Tom’s lyrics are deep, this is a journey, a story, filled with questions to which he doesn’t seem to have the answers. “Turning Pages” to put it simply, is a beautifully composed song that will appeal to muso’s and casual listeners alike. Track 1 (sorry for not reviewing this in order) is “Starlight” which probably falls more into the conventional, but don’t get me wrong, that’s no mean feat. To write a song of this style that’s comparable to the exceptional standards we’ve all come to expect is amazing, my issue is it’s just not OUT-standing. Where “Turning Pages” was different, I feel like I’ve heard “Starlight” before. Performance wise, the guys are allowed to flex their musical muscles a bit more on this track, there’s some serious talent on show here, and Tom gets to show us his impressive vocal range. The song builds to a dramatic but refined crescendo. “Starlight” is again beautiful, just slightly “safe” for my liking. Track 3 is “Lesson Still Young”, which reverts back to more moody territory. There’s a hint of Irish folk inspiration seeping through, but not enough to deter anyone who’s not really into that sort of thing (points to self). This track is more of a showcase for Tom’s vocals, both in context and musical talent. The crux of the song is reverting back to the aforementioned “love scorned songwriter”, but Tom treats it with real passion and soul, thus avoiding the potential pitfalls of turning the song into a bore-off/cheesefest, again no mean feat, something that can only be achieved with talent and inspiration from genuine feelings. It’s worth pointing out I had mixed feelings about all 3 song’s track lengths. All 3 fall short of the 3:30 mark. If something is this good, then I could feel cheated if I’m left wanting more, however, the grass may be green on the other side. I feel that the “Lesson Still Young” EP is a teaser of what bubbling away under the surface of 4 very talented musicians who are spearheaded by a songwriter who has the ability and bravery to do something different and amazing. I can’t wait for more. I later on looked into session work in London and through one fateful meeting in a coffee shop things started getting very exciting. Since autumn 2008 I’ve travelled all over the UK playing bass and backing singing for some great solo artists, at some ridonkulous shows like The Tabernacle with Gary Phelan, playing live on BBC Radio London with Jadan Lee, and switching on Preston’s Christmas lights with Mike Dignam. Three years down the line I’ve moulded these experiences into something to help begin my own development as an artist, performing my songs with my own band. Being under the spells of Jeff Buckley, City & Colour and The Cure the music we’re producing is best described (I think!) as acoustic folk rock. The post Staniford – Lesson Still Young (EP) appeared first on MakoMusic.